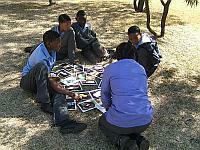 All our school programmes make extensive use of the Delta Environmental Centre as well as Delta Park. Our programmes are designed to meet the curriculum requirements at all levels and are aligned to the CAPS requirements. Our programmes may also be altered to suit any specific needs. Our facilities include the Delta building with a Natural History Museum, The Biodiversity Room with an insect collection and animal skulls, the Energy Room and the Water Room as well as Delta Park (104ha), that incorporates the Florence Bloom Bird Sanctuary, the SASOL Sensory Trail and the Water Wise Garden, three dams, the Braamfontein Spruit and Recycling Drop Off facilities, all which serve as an “outdoor classroom”. The weather and how nature, animals and people are affected. Using the environment around us to look at and name different shapes and colours. Using the environment around us to explore our senses. The importance of a clean environment and recycling. Exploring different types of birds and their general characteristics. and how to grow a plant from a seed. Sun, air, water, soil and water and their importance in our environment. Animals, other creatures’ and their homes. harm us. Exploring the life cycle of an insect. What is pollution, the different types and the effects of pollution on people and the environment? Exploring what happens to our waste and finding out about reducing, re-using and recycling. Characteristics of living and non-living things and exploring the requirements of plants and animals. Habitats are the places where animals feed, hide, produce young and provide shelter. animals cannot make their own food, depending on plants for their energy. threats to ecosystems and how to overcome these. Exploring the beauty of insects, their ecology, adaptations and conservation. 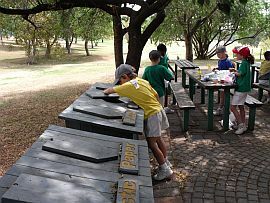 potential of waste items, understanding landfills and how to manage waste sustainably. the classification of living things while exploring the diversity of animals and plants on earth. 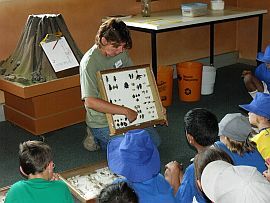 An introduction to ecology, ecosystems and food chains and webs that occur within the ecosystems. Identifying adaptations that occur in an ecosystem and the importance of conserving an ecosystem. Identifying renewable and non-renewable resources and the effects of unwise use of resources. conventional energy sources and their impact on the environment as well as non-conventional sources of energy. South Africa’s changing energy needs will be explored and energy management towards greener economies and sustainable lifestyles will be discussed. Learners will also be encouraged to start an energy savings campaign and the programme outlines the steps that can be used to design and implement such a campaign.